'As someone who is involved in influencing others toward excellence and inspiration, you need to be the best you can be for yourself, your mission, and those you lead.' —Dr. John Townsend. Leaders at the forefront of society - executives, business owners, managers, and influencers - are constantly pressured to respond to the available research, analysis, and other linear sources of information in order to make critical decisions. But if you rely only on external data and fail to harness the power of your own subjective experience, you lose access to a great value toward your goals and outcomes. 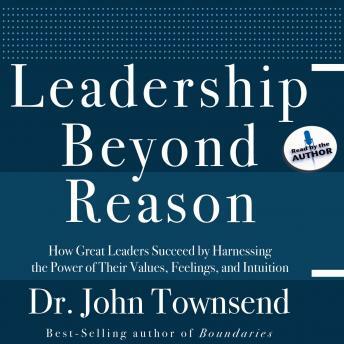 A human behavioral expert and leadership consultant, Dr. John Townsend says there are priceless resources within every leader that are all too often neglected and ignored. Leadership Beyond Reason clarifies the leader’s internal world and teaches you how to draw on your intuition, emotions, creativity, spiritual life, and values. These principles will help you stand out from the rest in a world growing weary of paint-by-the-numbers leaders. Whether you are increasing your skill set or looking for a new way to address your organization’s needs, Dr. Townsend’s insight and advice will train you to take advantage of the ability to look inward as well as outward and achieve great results.